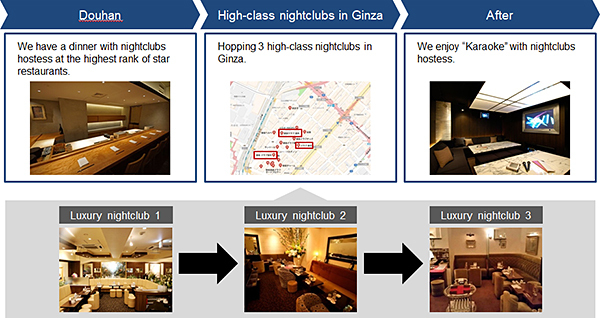 Ginza Bar Hopping is a service that Ginza night experience at high-class nightclubs, ”Dohan*” & ”After”. Dinner is given at the highest ranked star restaurants, and you can enjoy “karaoke” together with the nightclub hostess. Many high-class nightclubs in Ginza refuse first-time customers, saying that customers without introduction from somebody are not allowed to enter their facilities. In short, it is a valuable experience!!!!!!! It is possible to coordinate the best night life in Tokyo after conferences, academic societies and business negotiations. *Douhan (Pre-company) : Guest can meet a nightclub hostess in the different place (usually restaurant) before entering facilities. For a company’s wealthy customer, I want to expand an experience-based trip product to Japan. 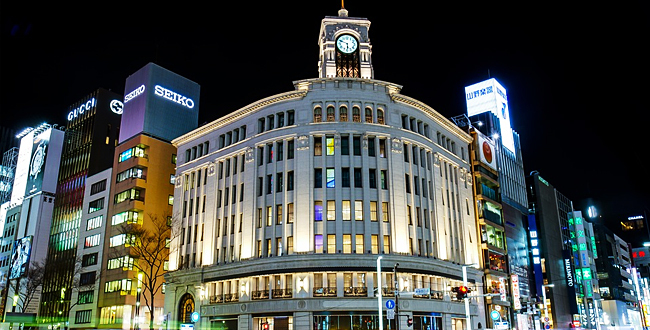 I really experience and want to check what high-class nightclubs of Ginza is, whether it can be added to a company’s product lineup when it comes to a trip in Japan. 【Case 2】Conferences, Academic societies and Business negotiations. 1. After a conference, I want to deepen the interchange among participated business owners in a high-class nightclubs of Ginza. 2. After academic societies, I want to experience a Japanese high-class nightclubs with participants. 3. I want to invite the overseas new business partner whom I met in business negotiations to a high-class nightclubs of Ginza. *This case includes Dohan (star restaurant), Hopping 3 high-class nightclubs, After (Karaoke). *We might not be able to meet your “Dohan” request and “High-class nightclubs” request. *If you changes during the experience, you’ll pay additional fee. *15% of the total amount as service fee for guides are needed. Please contacut us about “Ginza Bar Hopping” from our contact page below.